The article below was written by Professor Tony Martin in 2011 when the Habitat Restoration project was first starting. Since then “Team Rat” together with support from FOSGI and SGHT trustees and advisors have worked hard to to plan and execute the habitat restoration, spreading bait over all potenitally rat and mouse infested areas of the island in 2011, 2013 and 2015. Article by Professor Tony Martin, Habitat Restoration Project Director. 2011. 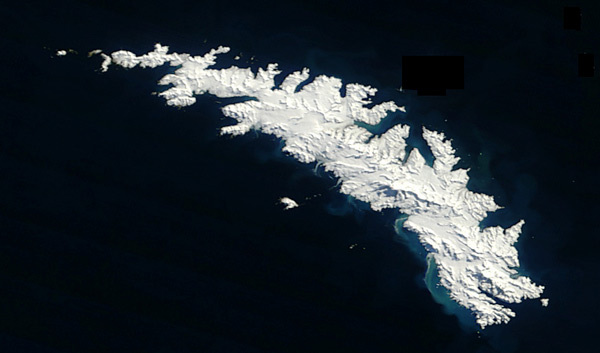 Viewed from space, South Georgia is a tiny speck of land surrounded by vast areas of featureless ocean. These high latitude oceanic waters are extremely rich and productive, and provide food for millions of marine birds, seals and whales. The most abundant and noticeable of these aquatic creatures are birds of various shapes and sizes. But no matter how well adapted to the sea they may be, every one of them requires land on which to nest. For huge numbers of birds feeding in the South Atlantic, the obvious place to call home is South Georgia. Today 29 species of bird breed on the island, varying in size from the massive Wandering Albatross, with the largest wingspan of any bird in the world, to the Wilson’s Storm-petrel which is little bigger than a sparrow. Black-browed Albatross. Photo by Tony Martin. 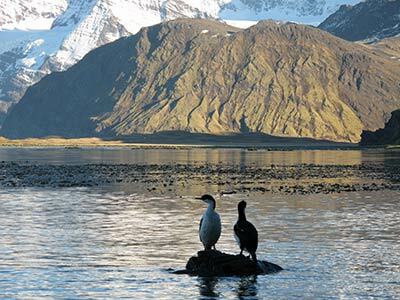 On South Georgia, the largest of these seabirds, such as the albatrosses and penguins, are little affected by rats and mice. But the majority of seabird species, and all three of the ‘land’ birds (two ducks and a pipit), are small enough to fall prey to rats, and most or all of the chicks they may hatch on the main island are killed and eaten. This is particularly true for the Storm-petrels, Diving-petrels, prions, Blue Petrels, and the pipit, but some young or eggs of ducks, White-chinned Petrels, terns, shags and sheathbills are also likely to be consumed. Even the present invulnerability of the larger birds to rodents may not last. Mice on Gough Island, also a UK Overseas Territory, have learned how to eat albatross chicks as they sit on their nests, to the extent that the albatross population is declining at a dangerous rate. Why are South Georgia’s birds so vulnerable to rats? For two main reasons. Firstly, because these species evolved over millions of years to nest on islands without rodents, so they have no defense against them. Only when humans started accidentally introducing rats and mice to islands as stowaways did the trouble start. Secondly, they cannot escape them. There are no trees on the island, so all birds must nest on or under the ground, and this is where they are taken by the predatory brown rats which also live underground much of the time. The only hope of seabirds ever returning to their historical home of South Georgia is for the rats and mice living there to disappear. This is unlikely to happen naturally, certainly within the window of time before the glaciers retreat and allow rodents to over-run the entire island. They must therefore be removed by humans, a few generations removed from the humans who inadvertently caused the original problem by allowing rats to go ashore from their ships. The challenge is daunting, but the South Georgia Heritage Trust stands ready to meet it. Our objective is simple – to remove every single rodent from South Georgia and its outlying islands by the year 2015, and working with the Government of South Georgia, ensure that no rodents ever return to the island’s shores. Ultimately, the whole of South Georgia will be overrun by rats and mice unless every single rodent is eradicated, and soon. It may take a decade before we can be sure that no rats remain on South Georgia, but we expect to see some evidence of success in only one or two years. The resident pipit is likely to be the first bird to respond to the absence of rats – our equivalent of a canary in a coal mine. 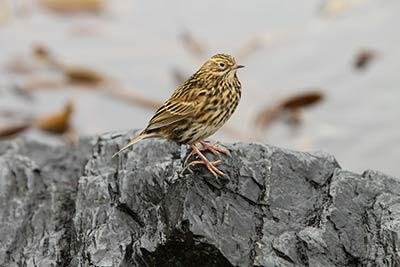 If pipit song is heard, and certainly if young pipits are seen, we can be sure that the rats have gone. We also have other means of checking for the presence of rats, and will be monitoring the baited areas each year. Update July 2015 from Tony Martin. Early signs of bird recovery. If/when we succeed in getting rid of the rats, is it possible that mice could then explode in numbers and do similar (or worse) damage to wildlife; however this is very unlikely for two reasons. Firstly, mice do currently exist in areas of South Georgia without rats, and here they are neither very abundant nor are known to be damaging wildlife to any great extent. Secondly, our baiting regime is designed to offer a good chance of removing any mice that might live among the rats in any area. Update July 2015 from Tony Martin. Monitoring for signs of surviving rats.“The rule of thumb internationally is to investigate two years after you finish baiting and if you don’t find any rodent sign you say that’s it – job done. We’re going to leave it a little bit more than that and in fact in the case of phase 2 it’ll be four and a half years, because it is such a vast area. The chances of rodents re-invading the island after it has been cleared is, of course, an issue of paramount importance. There is no point in going to the effort and expense of clearing South Georgia if rodents are allowed to subsequently re-invade. Rodents will only get back onto the island if humans take them there. The Government has already introduced measures to reduce the risk of this happening, and will continue to tighten and enforce them. Ultimately, keeping South Georgia free of invasive pests is dependent on the actions, care and vigilance of all its visitors. A single careless act could result in the whole island being lost to rats again, so the stakes are very high. Since this article was written, the baiting of South Georgia has been completed. Many reports have already been received of a significant increase in the number of the endemic South Georgia pipits and South Georgia pintails as well as Wilson’s storm petrels. The first pipit nest in living history to be found on mainland South Georgia was discovered in January 2015 by Sally Poncet, fittingly one of the Team Rat members. However, monitoring to fully assess the effectiveness of the eradication still needs to be undertaken in order to ensure that South Georgia truly has been returned to it’s pre-rodent state and for this we need your continued support.